We LOVE pasta dishes like lasagna and fettuccine Alfredo. The excessive calories and carbs? Not so much. Luckily, we've figured out how to enjoy the classic flavors without the classic calorie counts... Check 'em out! Microwave squash for 6 minutes, until soft enough to cut. Halve lengthwise; scoop out and discard seeds. Bake until tender, about 40 minutes. Meanwhile, in a medium bowl, combine crushed tomatoes, ricotta cheese, garlic, onion powder, and Italian seasoning. Add 1 tbsp. basil, 1/4 tsp. salt, and 1/8 tsp. pepper. Mix until uniform. About 10 minutes before squash is done baking, bring a skillet sprayed with nonstick spray to medium-high heat. Add beef, and season with remaining 1/4 tsp. salt and 1/8 tsp. pepper. Cook and crumble for about 4 minutes, until fully cooked. Reduce heat to low. Add ricotta mixture to the skillet. Cook and stir until hot and well mixed, about 1 minute. Remove baking pan from the oven, but leave oven on. Remove squash halves, and blot away excess moisture. Empty water from baking pan. Return squash halves, cut side up. 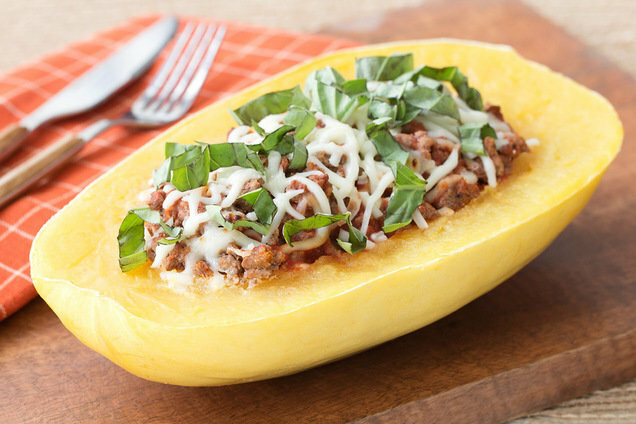 Evenly divide beef-ricotta mixture between the squash halves. Sprinkle with mozzarella cheese and remaining 1 tbsp. basil. Bake until filling is hot and cheese has melted, about 5 minutes. Using a spiral vegetable slicer like the Veggetti, cut zucchini into spaghetti-like noodles. (If you don't have a spiral veggie slicer, peel zucchini into thin strips, rotating the zucchini after each strip.) Roughly chop for shorter noodles. Place cauliflower in a large microwave-safe bowl. Add 1/4 cup water. Cover and microwave for 5 minutes, or until soft. 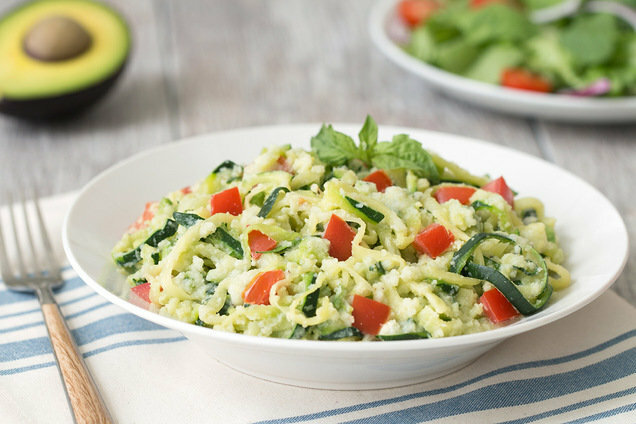 In a blender or food processor, combine cooked cauliflower, avocado, Parm, garlic, salt, and pepper. Add 1/4 cup warm water. Blend on high speed until smooth and uniform. Bring an extra-large skillet sprayed with nonstick spray to medium-high heat. Cook and stir zucchini noodles until hot and slightly softened, about 3 minutes. Transfer noodles to a strainer, and thoroughly drain excess liquid. Remove skillet from heat, re-spray, and bring to medium-low heat. Add noodles, sauce, and tomato. Cook and stir until hot and well mixed, about 2 minutes. Hungry for More No-Noodle Pasta Swaps? It's National Devil's Food Cake Day, May 19th! Time for a Chocolate PB Cake Pop, dontcha think? Swapping veggies for pasta is all the rage -- click "Send to a Friend," so your pals can rage too!